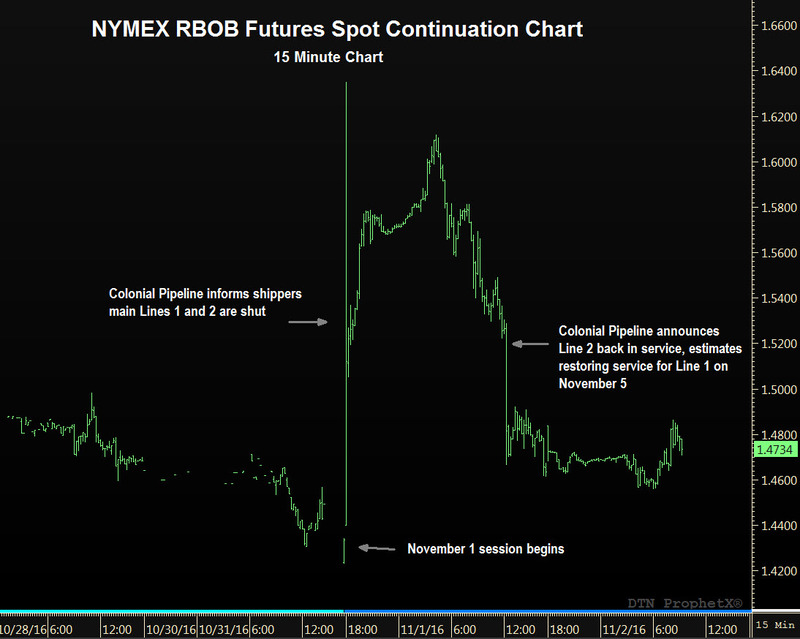 Within minutes of taking over as the nearest delivered contract in the evening hour of October 31, December RBOB futures spiked 18.56cts or 12.8% to a five-month high on the spot continuous chart of $1.6351 gallon in trading on the New York Mercantile Exchange triggered by the second outage on the ever important Colonial Pipeline in less than two months. A crew working on main Line 1, a massive 40-inch pipeline with a flow rate of 1.37 million bpd that transports gasoline, struck the pipeline with a track hoe and caused an explosion and subsequent fire. One worker was killed and five were hospitalized. The accident occurred in Shelby County, Alabama, several miles away from a pipeline rupture discovered September 9 that shut Line 1 which later operated with restricted service for nearly two weeks through September 21. Roughly 252,000 gallons of gasoline leaked from the rupture, with Colonial constructing a 500-foot above ground bypass around the leak to restore full service. The bypass was set to be removed sometime between November 2 and 10. Colonial Pipeline again shut Lines 1 and 2 October 31, with the latter a 36-inch pipeline that transports distillate fuels, including diesel, heating oil and jet fuel. Line 2 has a 1.16 million bpd flow rate. Both Lines 1 and 2 originate in Houston, Texas, and run in a northeast direction to Greensboro, North Carolina, the location of a tank farm and interconnection point on the Colonial system. From Greensboro, Line 3 runs to Linden, New Jersey, and Line 4 to Dorsey, Maryland, both 32-inch pipelines. The Colonial Pipeline is a critical conduit for delivering refined fuels to states along the eastern seaboard, with the 2.5 million bpd 5,500 mile pipeline consistently running at or near full capacity, and connects 29 refineries and 267 wholesale distribution terminals. Refined fuels from the Gulf Coast are needed by states along the Atlantic Coast as well as imports because the region lacks sufficient refining capacity. December RBOB futures would pare the advance as the November 1 session wore on, settling 6.46cts higher at $1.4841 gallon, dropping back nearly 6.5cts shortly after the noon hour as Colonial Pipeline said it had returned its main Line 2 to service and that it believed it would restore service on its main Line 1, which was still on fire at the time of the update, by November 5. Nearest delivered RBOB futures traded in a 19.51cts range November 1, the widest spread since a 20.88cts daily range October 31, 2012 amid a selloff ahead of a contract expiration. A month prior on September 28, 2012, nearest delivered RBOB futures traded in a 29.51cts range amid a short squeeze ahead of contract expiration, trading that day in a $3.1307 to $3.4258 gallon range. In bulk wholesale spot trading on November 1, cash differentials rallied 4.0cts gallon or more for gasoline in the New York Harbor to amplify the advance by futures, with spot prices ending the session a dime or more higher in anticipation supply would tighten. In contrast, cash differentials weakened 4.75cts or more for gasoline in the Gulf Coast region to limit the gain in spot price to less than 2.0cts gallon, with concern supply could get bottled up in the region. The 13-day disruption in September triggered an 8.475 million bbl or 13.2% draw down in PADD 1 East Coast gasoline supply during the week-ended September 16 to a 55.535 million bbl 22-month low according to the Energy Information Administration, with the region’s gasoline supply reaching a 72.493 million bbl 26-year high on July 22. The large supply cushion in September joined by a surge in waterborne imports muted a greater price response, although retail prices in the Southeast jumped 9cts gallon during the disruption, and some retail outlets ran out of fuel. During the five weeks since September 16, East Coast gasoline supply has increased 7.34 million bbl to 62.874 million bbl. If Colonial can restore service on the main gasoline line by November 5, the price impact will be limited and RBOB futures have likely installed its high in response to the outage during the early moments of the November 1 session.